Instagram created a wave in social media because it was the first social networking platform that exclusively used visual content to communicate rather than conventional text. Since it was designed ground-up for smartphones, the Instagram app makes it very easy for users to shoot photos, beautify them, and upload the images to their Instagram accounts on the fly. This convenience has made it extremely popular with the smartphone generation, especially those involved in creative pursuits like graphic designers to take to Instagram to show off their creativity. However, with more than 95 million photos being posted by users every day, it can be very easy for users to miss out seeing your posts unless you take care to evolve a brand and make use of a consistent hashtag strategy to improve your visibility and the chances of your being discovered in Instagram searches by users. Hashtags are essential if you want to get your posts noticed by your target audience, especially potential clients. A clever hashtag strategy can be used by users, influencers, brands, and businesses to connect and engage with their potential audience. As a graphic designer, it is not enough to have excellent design skills, you must also be able to make yourself discoverable by potential customers, and your peer group so that you can connect with them and engage with them to open up lucrative opportunities. With regular interaction and exposure to your creative designs, they could very well become clients or recommend you to others. As a graphic designer, some of the most obvious benefits of a well-chalked-out hashtag strategy include the sharing of resources, the ability to highlight your creative portfolio. Building your personal brand, creating networks, follow influencers, and with time build enough authority and follower base to become an influencer yourself. When you search content by the most happening hashtags or follow influencers with the help of the hashtags, you can stay current with the latest trends in graphic design and news in the graphic design communities. By following these trends, you can keep your creativity current so that your potential customers will also find your work relevant and contemporary. As a graphic designer when you publish content to your account, you are doing it for the specific purpose of gathering as many eyeballs as possible. Instagram has now added a new feature that allows you to monitor and measure the performance of your hashtags. With this insights tool, you can easily find out about different performance metrics of your post like the reach, impressions, and from where users came to view your content. By adding relevant hashtags to your Instagram Stories, you can increase the chances of your followers being able to discover content that they will really like. Using hashtags in Stories is no different from the usual procedure of adding hashtags to your photo content captions. Clickable hashtags are a recent addition to the features being unveiled by Instagram. This update has the capability of turning profile usernames as well as hashtags embedded in the bio into clickable hyperlinks with the inclusion of # or @ in the text of the bio section. By doing this, graphic designers are able to facilitate users to click to view the content in that account. If you use branded hashtags, you can highlight branded content and add extra functionality to your Instagram bio. The inclusion of hashtags in your graphic design content that you publish to your account cannot be arbitrary if you want to get the best results. It is essential to have a proper hashtag strategy. You need to plan ahead regarding what you want to achieve and think of the most relevant and important hashtags that you can apply. With a structured approach, you can create posts that connect with the audience you want to reach. You should only use hashtags that are relevant and for this, you need to engage in research as well as find out what the current trends are. It has been observed that if you use location-specific hashtags, more users tend to reach out and connect as they are attempting to solve their own problems locally. Even videos that are helpful in adding more detail than what is possible in a still photo can be posted with appropriate location-specific hashtags to attract the attention of users looking out for local solutions. Using location-specific hashtags also enables you to reach out to specific audiences faster and more effectively than the competition and that can be a great advantage. Apart from the generic hashtags that you need to use, you should also brand your hashtags as well as use custom hashtags that are more relevant to your niche in graphic design. A Simply Measured study quoted by Sprout Social affirms that today, some 70% of hashtags are branded. 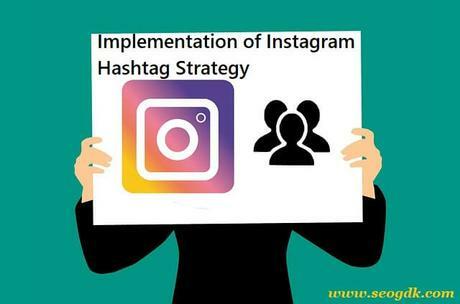 For obtaining the maximum bang out of your Instagram account, you need to not only post content that shines but also implement a structured hashtag strategy that allows you to expand your reach and connect with audiences who are likely to be your prime customers.